This book is the first one in the omnibus edition of Norton’s work, Visions of Distant Shores: An Andre Norton Collection, containing seven of her novels. I uploaded it onto my Kindle for the princely sum of 77p. Shann Lantee is left stranded on the alien world of Warlock after the Survey camp where he works is wiped out in an attack by the Throgs, beetle-like beings so alien no one has figured out how to communicate meaningfully with them. Shann was signed up to feed and clean out the animals and perform all the lowliest tasks. He hasn’t been trained to survive on an alien planet. How will he manage to stay alive in this hostile environment against the most voracious and implacable enemy humankind has encountered? This book was first published in 1960, but I have to say that it doesn’t feel like it. Norton’s straightforward, unfussy style is evergreen and her characterisation – refreshingly for one of the earlier sci fi writers – is well developed. She manages to keep the narrative pace right up and her scene setting is excellent. In short, she is a technically accomplished writer who has absolutely nailed recounting a cracking adventure story set on an alien planet. I enjoyed the steady growth of her protagonist throughout the story. Shann Lantee has been brought up hard – coming from a world where there are few prospects. He was the dogsbody who happened to be performing one more grubby thankless task when the Throgs struck. Worse, he’d been targeted by one of the younger members of the Survey team, who made it his business to constantly bully Shann and get him into trouble with the Survey leaders. Understandably, he is both relieved and guilty to discover that his tormentor is one of the Throgs’ victims. He hasn’t been specifically trained in the survival skills that other Survey members specialised in, but he isn’t totally without resources. One of those grubby tasks is to tend for the two genetically enhanced wolverines who are trained to hunt out the local wildlife and warn the Survey group of anything dangerous crashing about in the undergrowth – a real boon when all sorts of things crash about in the undergrowth, other than the Throgs. From this strong opening, when we immediately bond with Shann and care about his predicament, we watch as he steadily gains in confidence while dealing with a variety of challenges throughout the story. For anyone struggling with how to structure a novel, this is a textbook example of how to achieve an exciting, readable story – and yes, the ending also satisfactorily ties up the dangling ends, while affording an opportunity to take the plot further. 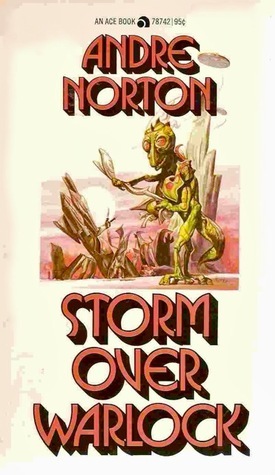 This is only the second Andre Norton book I’ve read – but I would have happily paid a whole lot more than 77p to have read this one gem. And there’s six other books in the omnibus… More than worth every penny, even if the rest turn out to be real stinkers. And from what I’ve read so far, I’ve no reason to believe that the lady wrote stinkers… If you are a bit broke at the start of 2012 and looking for a bargain, quality read to add to your Kindle, then I highly recommend Visions of Distant Shores: An Andre Norton Collection. Happy Reading! Yay! Classics! I have five or so of her books but haven’t read any yet…. I really should.